Loyalty Day, whose supporters were known as "Descamisados". Descamisado (Spanish pronunciation: [deskamiˈsaðo]) is a Spanish word that literally means "without shirt" or "shirtless". The term was originally used by the narrator in Victor Hugo's seminal 1862 novel Les Misérables to refer to the revolutionary Spanish masses. Following the defeat of Napoleon Bonaparte at the Battle of Waterloo, the French (Bourbon) monarchy was restored to power. The Bourbons acted to prop up the Spanish monarchy against the popular forces of the Spanish social revolution in the Spanish War of 1823. Hugo's character is commenting on the use of the term by the supporters of the French Bourbons. The word was used pejoratively and in direct comparison to the derogative term applied to the French popular masses, the sans-culottes of the French bourgeoisie revolution of 1789. In the 20th century, it was also used as an insult by the elite of Argentina to describe the followers of Juan Perón, who served as president of Argentina from 1946 until 1955, and then again briefly from 1973 to 1974. The term was later reclaimed as a term of pride, with Juan Perón and his wife Eva Perón affectionately referring to their followers as "descamisados". And during his 1945 campaign for president, Juan Perón toured the country on a train that he named El Descamisado. 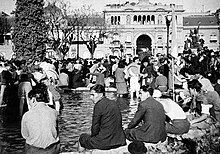 By most accounts, the term has its modern origins on October 17, 1945, when thousands of supporters of Juan Perón gathered in front of the Casa Rosada making a demonstration to demand Perón's release from prison. While waiting for Perón on this hot day, many men in the crowd removed their shirts—hence the term "shirtless". However, there is much debate among scholars in regards to the origins of the label. Some claim that the word was coined to describe the working poor, the social class from which Perón drew the greatest amount of his political backing, who were so downtrodden that they could not have afforded to buy shirts. Perón's use of the labor unions as a means of consolidating his power lends credibility to the claim. The descamisados of Peronism have occasionally been compared to the sans-culottes of the French Revolution, though such a comparison should be made with caution. In 1989, Fernando Collor de Mello in his presidential campaign used descamisados and pés descalços ("shoeless") to refer to the poor people. ^ O'Donnell, Pacho (2009). Juan Manuel de Rosas, el maldito de la historia oficial. Buenos Aires: Grupo Editorial Norma. p. 39. ISBN 978-987-545-555-9. ^ Jonathan Ablard, Madness in Buenos Aires: Patients, Psychiatrists, and the Argentine State 1880-1983 (Athens: Ohio University Press, 2008), 179. ^ Thomas Skidmore and Peter Smith, Modern Latin America (New York: Oxford University Press, 2005), 86-9. ^ Mark Kishlansky, Patrick Geary, and Patricia O'Brien, Civilization in the West: Since 1555, Vol. 2, 6th ed. (New York: Pearson Longman, 2006), 621. ^ Thomas Skidmore, Modern Latin America, 86-9. ^ Clayton, Lawrence A. (2005). A History of Modern Latin America. p. 504. This page was last edited on 9 September 2018, at 01:14 (UTC).